I have always and will continue to grow my knowledge, yet apart from the strong basic hoof care rules that we all follow, the optional add ons can be overwhelming! Something that has always caused me confusion are hoof oils, balms, lotions and potions! 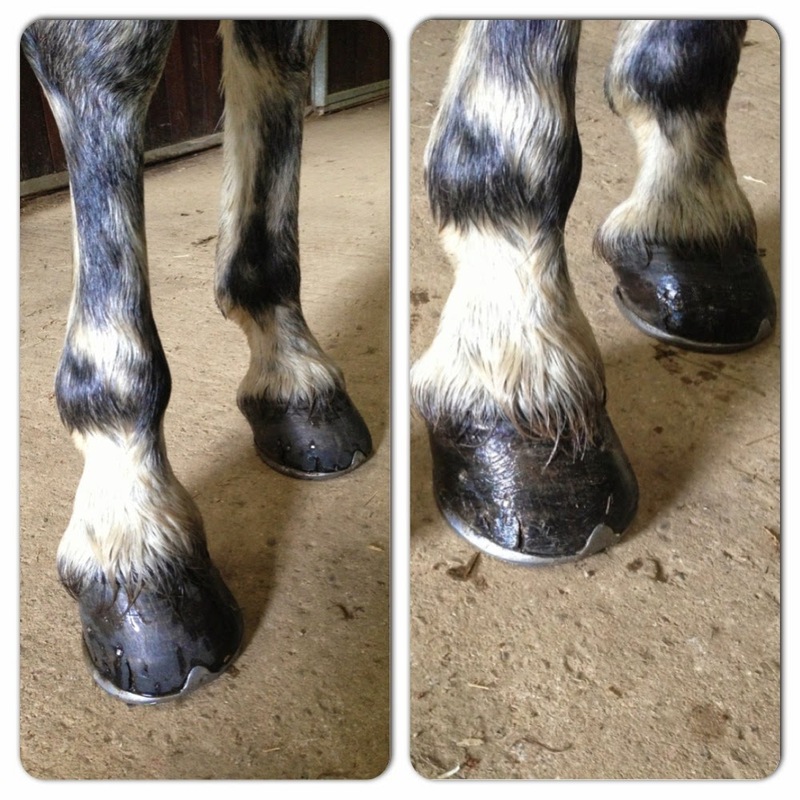 Many believe hoof products interfere with the hooves natural ability to regulate moisture, and that hooves will exfoliate themselves without human conditioning...makes sense, but what about when human conditioning means horses are moved from wet muddy paddocks, to dry stables with bedding specifically designed to absorb moisture, upsetting mother natures way? With all this in mind, Silverfeet's Hoof Balm appealed to me because it is a natural product. Formulated using ingredients from eco-sustainable sources and consists of a vegetable oil/ beeswax bade plus essential oils and the all important silver complex (silver ions). It doesn't contain any harsh chemicals and is therefore safe for everyday use all year round. The balm - in my case, also comes in a liquid format, containing all of the same properties as the balm and was launched in December 2013, I am yet to try this - should be applied to the hoof wall, sole and frog daily in order to produce an effective barrier against the ever changing environment, whilst the silver ions maintain hoof health and fight bacteria that can lead to smelly feet. I have used Silverfeet Natural Balm for 8 months, throughout the wet winter, dry spring and again...wet Summertime! My GeeGee, Oscar's hooves have remained pretty consistent considering our extreme weather and we haven't had any nasty smells or signs of thrush, just clean, shiny, healthy hooves! Which is impressive to say he lost a shoe almost every 3 weeks during the worse part of winter due to stepping on his own feet when dashing around in the muddy paddock, but thankfully this didn't affect his hoof health too much. I apply the balm to clean, dry hooves with a hoof oil brush, as it's a balm it doesn't leak or spill in your grooming bag and it smells deliciously refreshing...aloe vera, eucalyptus...tea tree! Hmm...wish there was a 'tap & smell' option on the screen! The hoof balm comes in four colours, I chose the natural balm, however it also comes in pink and blue, these balms apply clear, just like the natural balm, only claim to enhance the natural hoof colour - need to add a pot of this to my show grooming kit as I'd love to see how it enhances colour...and whether it really does make it a difference! And finally, a black balm which is specifically for black hooves, again another one for me to try, as my GeeGee has four black feet!